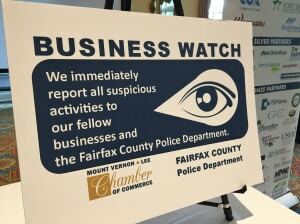 In partnership with the Fairfax County Police Department, your Chamber is pleased to announce a new Business Watch program to help keep your business safe. This initiative is a collaborative effort between businesses and FCPD to prevent and reduce crime through sharing information, raising awareness and training employees to recognize criminal activity. Officer Robert Urps, Mount Vernon Police Station, and Office Alice Eggers, Franconia Police Station will be offering special crime prevention training for businesses. They will provide training for events such as an active shooter situation or advice on how to recognize and report criminal activity. Contact the Chamber to receive a Business Watch decal to display on your business. These decals act as a deterrent as criminals become aware that we are organized and alert to criminal activity. Please register to attend using the Eventbrite link provided to ensure your seat is reserved for this workshop. Each location will have the same presentation.